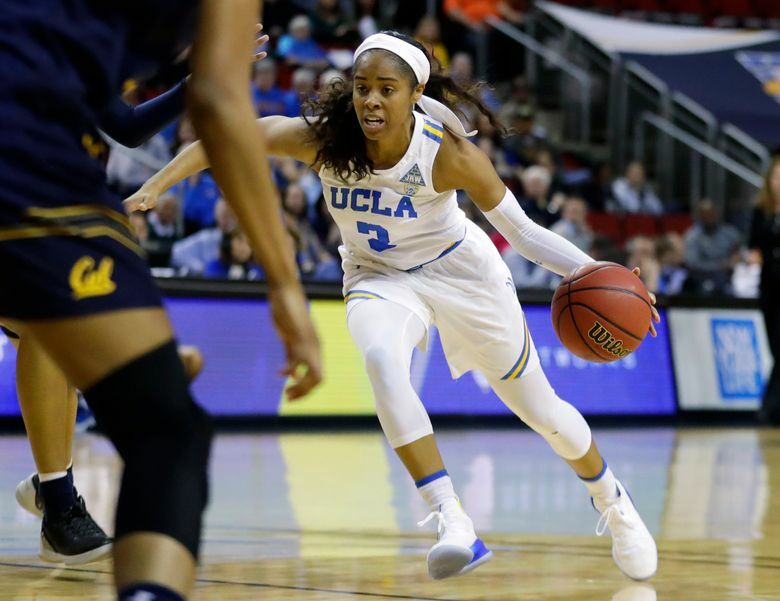 Jordin Canada powered the Bruins’ offense, scoring a team-high 27 points and making five steals to move into third place on UCLA’s career steals list with 327. The best demonstration of California’s fighting spirit in its eventual 77-74 Pac-12 tournament quarterfinal defeat against fourth-seeded UCLA came in the third quarter. Trailing the Bruins (24-6) by 11 points at KeyArena on Friday afternoon, the fifth-seeded Golden Bears (21-10) buckled down and leaned heavily on their star center Kristine Anigwe, who delivered 11 points in 10 minutes to give Cal a two-point edge heading into the game’s final quarter. Anigwe managed that despite leaving the game for about a minute in the third quarter when she hurt herself after coming down hard with an offensive rebound. Looking shaky, Anigwe stumbled off the court with help from her teammates and was taken to the locker room. She returned less than a minute later and got right back on the floor. UCLA (4) vs. Oregon (1), 6 p.m.
Arizona State (6) vs. Stanford (2), 8:30 p.m.
Cal coach Lindsay Gottlieb was evasive about Anigwe’s injury, saying only, “She hasn’t been feeling well” but that she was examined by the Bears’ medical staff and cleared to return. But Anigwe didn’t stay in the game for long. As a couple of Cal’s other starters, Anigwe got in foul trouble early against UCLA, and fouled out on a controversial call with three minutes left in the game and the score deadlocked at 67. Anigwe fouled out while battling for a loose rebound. She and UCLA’s Kelli Hayes made contact, and the referee called the foul on Anigwe instead of Hayes, much to the indignation of the Cal bench and Gottlieb, who protested vehemently. Gottlieb’s protests did Cal no good. Anigwe took a seat on the bench with 15 points and 11 rebounds, and with Cal’s big gun out of the way, UCLA began its comeback, getting four points and a crucial steal from Hayes, and five foul shots from Jordin Canada down the stretch to seal the victory. “I think we could have played a little better from start to finish, but I thought when crunch time, we put ourselves in a position to beat a very good UCLA team,” Gottlieb said. Canada powered the Bruins’ offense, scoring a team-high 27 points and making five steals to move into third place on UCLA’s career steals list with 327. The 5-foot-6 guard was everywhere, and it soon became apparent that while the Golden Bears could slow Canada down at times, they couldn’t stop her onslaught. From pullup jumpers and driving layups in the paint, crafty steals — she had three in the first half alone — to well-timed assists, Canada was a dominant force. “I think Canada is one of the, if not the, top pure point guards in the country,” Gottlieb said. The Bruins next play No. 1 seed Oregon in the first semifinal game Saturday. UCLA converted 24 of 34 free throws while Cal hit 11 of its 16. Eleven of Canada’s 27 points came off foul shots. Monique Billings scored 18 points and also had eight rebounds. Hayes contributed a career-high 18 points, and played a pivotal role in helping to sew things up at the end. The Ducks (28-4) lived up to their No. 1 seeding and No. 6 national ranking, annihilating the ninth-seeded Buffaloes (15-16) on the strength of 13 three-point field goals that tied the Pac-12 tournament single-game record. Satou Sabally had 21 points, Lexi Bando had 19, and Sabrina Ionescu had her 13th double-double of the season, scoring 10 points and dishing 13 assists, which also tied the tournament’s record. The Buffaloes got 20 points from freshman guard Mya Hollingshead. The Cardinal (21-9) put up a strong defensive showing, holding the Trojans to a season-low 26.8 percent shooting from the field. The Trojans (20-11), to their credit, bottled up Stanford’s leading scorer, Normandy Park product Brittany McPhee, who was held to seven points. The Sun Devils (21-11) held the 10th-ranked Beavers (23-7) to just five points in the fourth quarter in pulling off the upset. Kianna Ibis had 14 points and 14 rebounds for the winners.